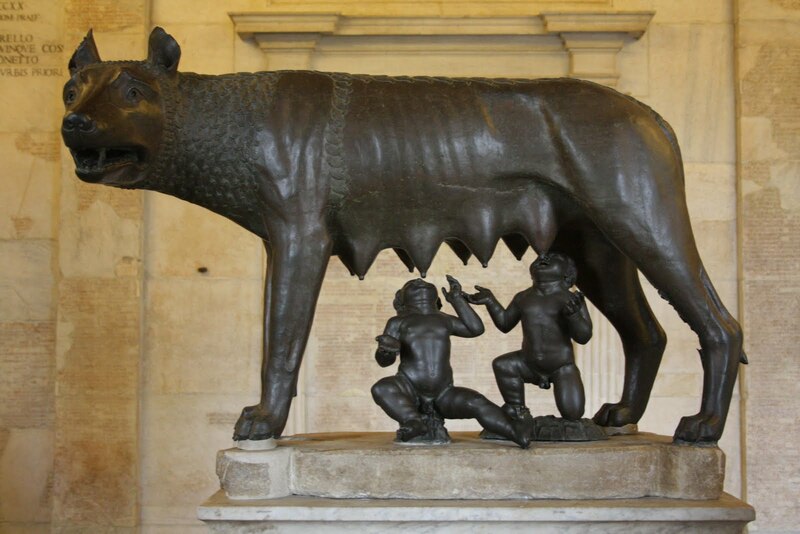 The bronze sculpture of a she-wolf nursing the infants Romulus and Remus that is the star of tourist stall t-shirts all over Rome is not the masterpiece of Etruscan metalwork it has been reputed to be since the 18th century. The latest radiocarbon dating performed on organic residue from the casting process confirms that La Lupa, iconic symbol of Rome, was made in the 11th or 12th century, not the 5th or 6th century B.C. The early history of the wolf is nebulous. It’s possible that she’s a copy of a genuine antique piece that once stood guard in front of the Lateran Palace, but that’s speculation based on descriptions of such a sculpture going back as far as the 10th century. The Capitoline Wolf we know today enters the historical record in 1471 when Pope Sixtus IV donated it and several genuine ancient bronzes to the Roman people. They were moved to Palazzo Dei Conservatori on the Capitoline, and would form the core of the new Capitoline Museum collection. It appears that the twins, probably the work of Florentine Old Master Antonio Pollaiolo, were added to the she-wolf around this time. There’s no controversy surrounding the Renaissance dating of Romulus and Remus, but the wolf’s symbolic power and sculptural quality has invested it with antiquity, whether it be Etruscan, Italian Greek or Roman. It was Johann Joachim Winckelmann, a German art historian, archaeologist and pioneer in the study of Greek, Etruscan and Greco-Roman art, who classified the wolf as Etruscan in his 1764 masterpiece The History of Art in Antiquity. According to Winckelmann, the curls and textures of the she-wolf’s pelt marked her as Etruscan; see the Chimera of Arezzo, a genuine 5th century B.C. Etruscan sculpture, for an example of that style. Although other scholars contested Winckelmann’s classification and suggested far later production dates, the Capitoline Wolf’s ancient origin, be it Etruscan, Roman or Greek, was popularly assumed to be true until 1996 when art historian Anna Maria Carruba was assigned to restore the bronze. She was the first person allowed to fully examine the sculpture in detail, and she found that it was cast in one complete piece using the lost wax method. The ancients cast bronze sculptures in pieces and then fused them together. This method allowed them to make more elaborate pieces with no risk of total failure. Single-piece casting was a medieval technique, used to produce objects like bells and cannon that needed a reliably rigid structure to function properly. Roman politicians weren’t thrilled with this discovery. It took years of discussion before scientific dating of the she-wolf was allowed, then more years before the results were published. “The new dating ranges between 1021 and 1153,” said Lucio Calcagnile, who carried out radiocarbon tests at the University of Salento’s Center for Dating and Diagnostics. Using accelerator mass spectrometry, the researchers extracted, analyzed and radiocarbon dated organic samples from the casting process. The results revealed with an accuracy of 95.4 percent that the sculpture was crafted between the 11th and 12th century AD.